A long time ago I ordered way too much soil for the first iteration of vegetable beds. Then I dug the rain garden and removed a ton of soil. Then Greg removed a lot of soil to resod the grass when we moved the vegetable beds. All of the soil from these projects ended up here. 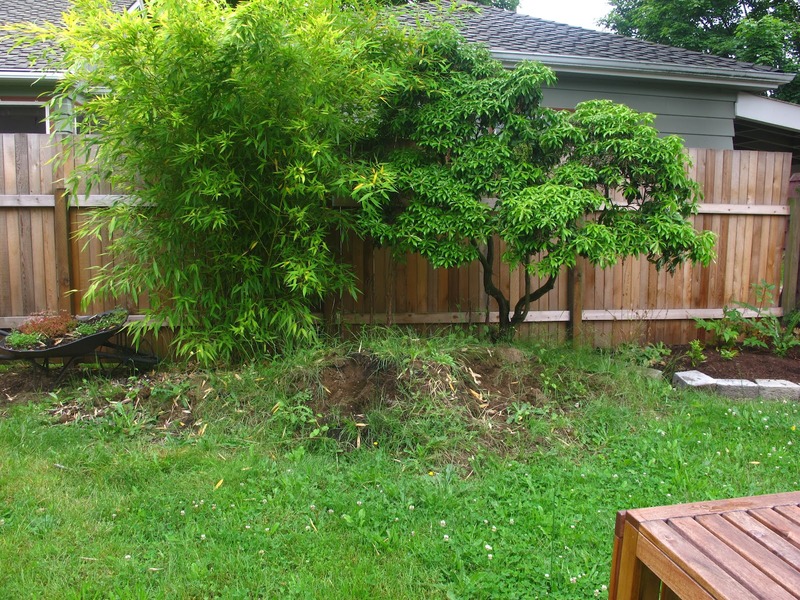 The grass grew up and over it, the bamboo invaded it, the neighboring cats used it as a toilet, and all the weeds that ever were took up residence here. There's about two cubic yards there. A show of hands: is anyone having the worst allergies of their lives? I am. I have never been so miserable. I spent Saturday night unable to sleep because I couldn't stop sneezing and I couldn't breathe. So I was operating on about four hours of sleep and I felt crummy when I decided that we should get rid of the pile. I started digging and filling up the truck. I got really frustrated and tired and then I started crying! I swear I don't normally do that. Greg was like, "Okay, wackadoo," and took over. I am the worst. We took two loads over to Wood Waste Management, who has the most genius business model. We pay them to take our dirt, then they mix it with compost and sand and sell it back to people as "soil mixture." But I'm happy they exist and our soil didn't end up in a landfill. And now our area looks like this. Next up I want to dig up that bamboo and put it in a container, as it is very badly behaved. And sadly I think the Pieris is going to have to go. Greg and I were planning and drawing and plotting the future deck and pathways and we just don't see how it fits in. I will probably shed some tears when we remove it because that's apparently what I do now. When I have a pile of soil left over from some project I start thinking about a new raised bed. I almost started bawling on Sunday while we were digging for our trenches and walkways in the front yard because I was just so completely overwhelmed. The only thing that kept me from it was the fact that our laborer was standing right next to me the whole time and I thought he might run away in fear of my craziness. You are awesome, don't ever think twice about it! Yikes...and I thought I got emotional in the garden. You should have seen the colossal pile of dirt we had after we planted the front garden and then the next summer dug out 7" of soil for the patio (to fill it back up with gravel, sand and pavers). We had to rent a skid that the city dropped off and we filled up.Yuck. There was a guy at Wood Waste Management that was removing something like 35 yards of soil from his yard, one truckload at a time. We felt so bad for him--there are much easier, less expensive options! We had bad bamboo as well, first we (Philip) dug 60 ft of trench to plant it. 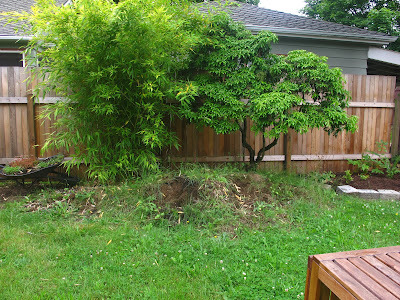 Then 3 years latter had to dig it all out...bad bamboo. Ugh, what a pain! That's a lot of bamboo to dig up. Oh no! I have to admit, lack fo sleep is pretty awful...I tend to get stressed about work and not sleep much during the more stressful times...and yes...end up pretty zombi-fied. I generally get crabby and angry when things don't go right...I've apologized to our neighbors on several occasions when I KNEW I was particularly crude (especially on bigger projects, the fence, digging up the parking strips). Of course, they always laugh and say they must not have heard any of it (I can see the horror in their eyes, though...they HEARD it)! Luckily, I am happy to say, I left my awful allergies back in Nebraska...but I remember them...truly miserable.